Article: Redefining Job Description: Is JD an effective tool to hire the right talent? While each component measures towards the effective output, non-clarity of the word called Job Description poses serious challenges. We have observed the process of hiring talent as a necessary component of infusing energy in the organisations, leading to better stability and output of our business results. While we measure the effectiveness of this process by the output in terms of Talent Hiring, we realise that an important ingredient of this is the Job Description and the nuances it portrays in front of all the stakeholders including Candidate, Hiring Partner, Hiring Manager, HRBP, Recruiter and the Business leader. While each component measures towards the effective output, non-clarity of the word called Job Description poses serious challenges. To bridge these gaps and ensure that the most important tool JD is made more and more meaningful and relevant, HR needs to redesign the document and change the approach with which they prepare the JD. 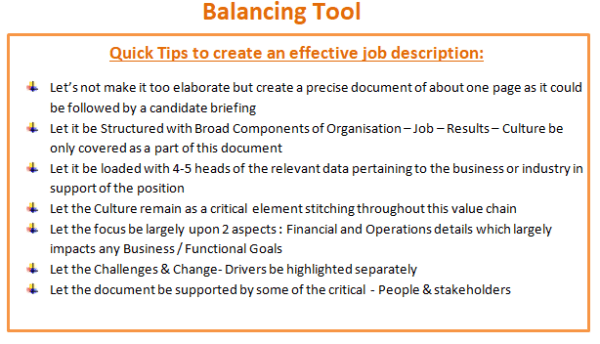 And there are various LEAD INDICATORS which can be utilized to prepare the Job Brief to capture the right candidate. Future Expectation Setting: To begin with its important to lay out what you expect in terms of delivery from the potential employee. This sets the foundation and gives the candidate a better idea of whether he/she is up for it or not. Although it begins with a generic theme, but after brainstorming and giving it some thought it does break down into smaller chunks and gives some clear and specific definitions of the expectations. Sharing Organisation’s Vision: Rarely do we see a job description highlighting the organisation’s vision and the impact which that particular role can have on that vision. Knowing how one can contribute to the company’s visions and mission is both inspirational and motivational as it gives a sense of direction and also makes the candidate feels how significant the role is for the company. Journey of Culture-Shaping: While fancy jargons and required competencies are often listed out in a job description, what is missing is the information about what the company is like. The lack of communication around company’s culture also often leads to the hiring of misfits, which becomes challenging both for employee and employer. Sharing the journey of the company’s culture and the story of its growth is something which can give candidates an opportunity to connect with the organization before even becoming a part of it. Complexity and Challenges ahead in the business goals: Besides painting a good picture about the company to attract more applicants, it’s equally important to lay down the complexities and challenges which a candidate must look forward to if he/she chooses to take the role. This helps in creating realistic template Identification of these complexities and challenges also helps in the identification of competencies. 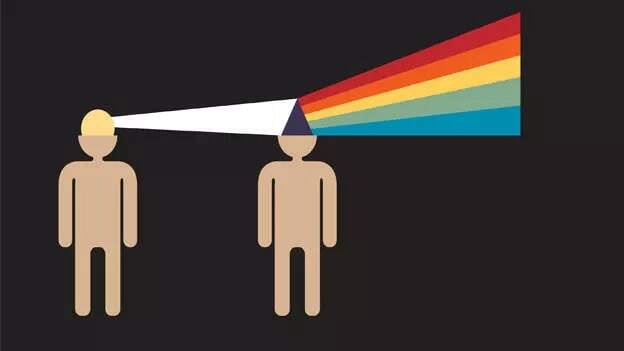 Depth of Knowledge Impact: Knowledge Enhancement and Development related to the job domain becomes a critical component of the job enrichment which a future employee would like to seek but rarely is provided in any document. Global approach and local execution: The approach behind creating such a document should change to global as hardly candidate knows about the global philosophy. The document could still stress lesser on the execution which is largely localised. This could easily be spearheaded by providing supporting documents like Company Brochures and Relevant Documents & also Critical Information Memorandum related to organisation moves in the industry dynamics. Some firms sign a Non-Disclosure Agreement before sharing such information particularly related to the search for Strategic positions. Career growth and Transformation: Basis the organisation’s strategic plan, it’s quite important to give a perspective of some of the future transformations which are part of the plan, both from individual and organization perspective. This would help in assimilating the aspirations of the talent and help him/ her get insights on his/her future with the organisation. Working Environment: Basis my discussions with the leaders, we have not come across a lot of documents consisting of the work culture, environment and mindsets which helps a candidate to gauge the kind of culture which is predominantly would exist the organisation. In the era of organisations focussing on Flexible Work Environment, Work-Life Balance, GIG Technology & Diversity, it may be critical going forward to mention about some of these. intrinsic benefits. Such workplace insights are critical for a future job brief. Given the current competitive landscape and the growing aspirations of resources, it is very important to define the objectivity in setting result expectations and clearly mark the cultural barriers which would help in balancing this against the candidate briefing uniformly across all stakeholders very effectively. NEXT STORY: Can over-crowding at the C-suite level slow down innovation?